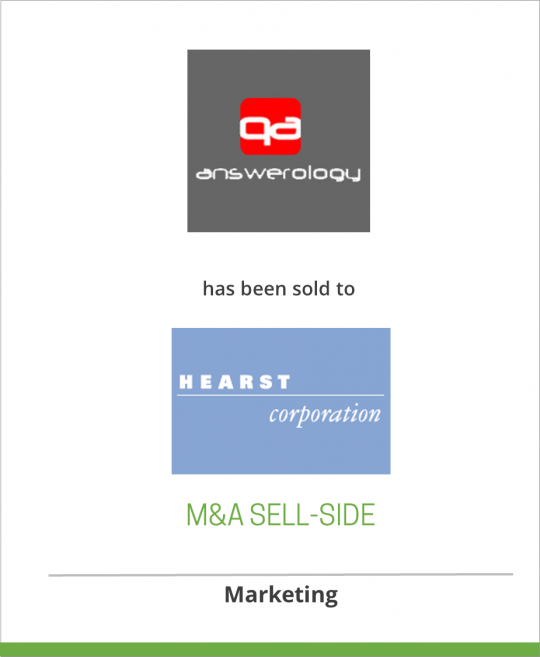 Answerology, a pioneer of the online Q&A, peer-to-peer advice community, has been sold to Hearst Corporation. Answerology launched officially in 2005, Answerology is operated in New York City with an overseas technology team. The site and core technology enable members to pose questions to a targeted community around relationship-related topics such as dating, family, career, and marriage. Community members can ask a question anonymously and select the demographic they’d like to get responses from (e.g. 22-25 year old Male Intellectuals from Boston). The premise of the site is that the most valuable answers for “life questions” come from the community, more specifically, people with relevant background and experience. Questions are posted on the site and emailed to registered users matching the target demographic. All answers are rated and frequent participants with high rankings are highlighted in the community. Based in New York City, Answerology was founded by Matthew Milner, a banker and author, initially as a promotional effort for his romantic comedy novel, Guy Critical. As the site built an audience, Matthew invested in developing the platform and renamed it Answerology. With its proprietary Q&A platform, the Company now aims to help people improve all their relationships – with their romantic partners, and with their family, friends and colleagues. It’s all about having a better life through shared experience. Hearst Magazines Digital Media launched in March 2006, Hearst Magazines Digital Media, a unit of Hearst Magazines, is dedicated to creating and implementing the digital online and mobile strategy for Hearst’s magazine brands and other sites which serve the company’s consumers and audience. The unit has launched or re-launched 18 web sites and nine mobile sites for brands such as Cosmopolitan, Esquire, Good Housekeeping, Marie Claire and Seventeen, as well as non-magazine brand sites such as TheDailyGreen.com, MisQuinceMag.com and MyPromStyle.com. During this time, Hearst Digital has also acquired the eCrush Network (eCRUSH.com, eSPIN.com), Kaboodle.com and RealAge.com to round out its growing portfolio of interests for teens and women.